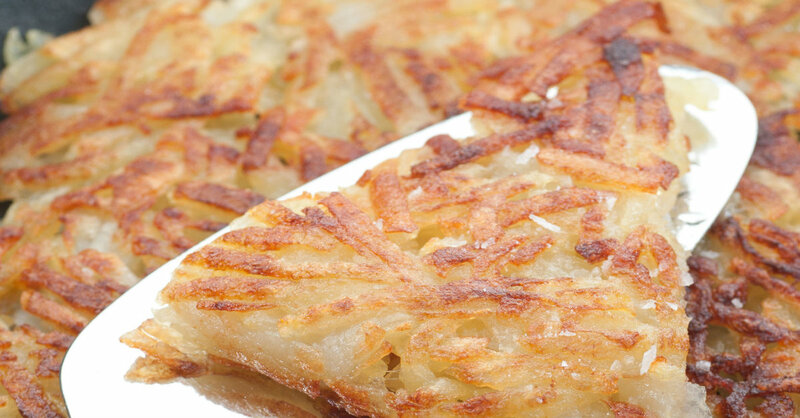 With This Recipe You’ll Have Perfectly Crispy Hash Browns Every Time! If you’re used to having sub-par fries or are tired of rock-like mashed potatoes, this is the recipe you need to make you fall back in love with potatoes again. Seriously, we love potatoes in all their many forms, but it’s perfectly crispy hash browns that make us go weak in the knees and have us begging for more. Below, we’ve got the best method for ensuring your hash browns come out perfectly each time…it’s all in the prep work, baby! From rinsing to wringing to pre-cooking, this tried-and-true technique delivers and we know you’ll love the finished result as much as we do! Take your peeled potatoes and grate them with the large-holed side of a cheese grater, or use the coarse grating blade in your food processor. Transfer potato shreds to a large bowl of water and let them soak, stirring occasionally, until starches are released and water is murky. Rinse under running water until runoff is clean. Place potatoes (in batches, if necessary) in a cheesecloth or clean kitchen towel, and wrap and wring until thoroughly drained and as dry as possible. Repeat. After you’ve drained them, put potatoes on a paper towel-lined plate and microwave on high for 2 minutes to par-cook them. Transfer cooked potatoes to a large bowl and season with salt and pepper, adding more or less to taste. Heat butter in a large, non-stick pan or skillet over medium heat until frothy. Skim off top solids, then, once hot, add potatoes and flatten them out into a 1/4-inch thick, even layer. Note: butter is hot enough when you drop a few shreds of potato in and they sizzle. Cook potatoes undisturbed for 5-6 minutes, or until a golden crust has formed on the bottom. Flip potatoes over and cook for another 5-6 minutes, or until other side is also golden brown. Top with more salt, if desired, and serve immediately.